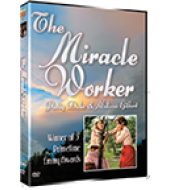 A true account of two people overcoming virtually impossible circumstances, THE MIRACLE WORKER, Nominated for 1 Golden Globe Award, with another 3 wins & 4 nominations, is inspirational for all. After Helen Keller is stricken with scarlet fever as a toddler, the malady leaves her blind, mute and deaf. Locked in an internal prison, unable to function normally or to communicate with anyone, Helen’s frustration over her plight drives her to fits of uncontrollable rage and tantrums. Terrified and unable to control her, Helen’s helpless and desperate family reach out to teacher, Annie Sullivan, hoping she can help Helen in her present state to learn to communicate, to adapt and to live comfortably in a world of sight and sound.